Reading and share top 17 famous quotes and sayings about Faith And Courage by famous authors and people. Browse top 17 famous quotes and sayings about Faith And Courage by most favorite authors. 1. "A leap of faith means hurdling into the unknown, and believing in our hearts that we will make it to the other side, despite not yet knowing what the other side is going to look like. It is taking bold action in spite of the fact that this action is forcing us out of our familiar territory, and our comfort zones. It also means taking action even though we cannot foresee the results or consequences of our choice. To do this requires both faith and courage!" 2. "The courage is light of one's life,is the beauty of today.The hope of one's soul,is the promise of a tomorrow.The times of our past,is a wisdom for anytime.The labour of our sacrifice and love,is a masterpiece of our moments.The voyage of one's mind,is a journey towards discovery.The joy in one's heart,is a gift for everyone.The faith of a soul,is a key to hope and to love.The true unconditional love of a heartis a priceless treasure one can ever give.For our mind, heart and soulIn any journey of rise or fall,Let faith, hope and love breathe!As you share it for whom your heart beats." 3. "Is he alone who has courage on his right hand and faith on his left hand?" 4. "The faithful man perceives nothing less than opportunity in difficulties. Flowing through his spine, faith and courage work together: Such a man does not fear losing his life, thus he will risk losing it at times in order to empower it. By this he actually values his life more than the man who fears losing his life. It is much like leaping from a window in order to avoid a fire yet in that most crucial moment knowing that God will appear to catch you." 5. "My theory was that if I behaved like a confident, cheerful person, eventually I would buy it myself, and become that. I always had traces of strength somewhere inside me, it wasn't fake, it was just a way of summoning my courage to the fore and not letting any creeping self-doubt hinder my adventures. This method worked then, and it works now. I tell myself that I am the sort of person who can open a one-woman play in the West End, so I do. I am the sort of person who has several companies, so I do. I am the sort of person WHO WRITES A BOOK! So I do. It's the process of having faith in the self you don't quite know you are yet, if you see what I mean. Believing that you will find the strength, the means somehow, and trusting in that, although your legs are like jelly. You can still walk on them and you will find the bones as you walk. Yes, that's it. The further I walk, the stronger I become. So unlike the real lived life, where the further you walk, the more your hips hurt." 6. "But Mrs. Brockington, old, alone, almost crippled by rheumatism, had faith and courage. She had more. She had a warm serenity, and when Ellen was with her, she almost had it too. For goodness is catching. 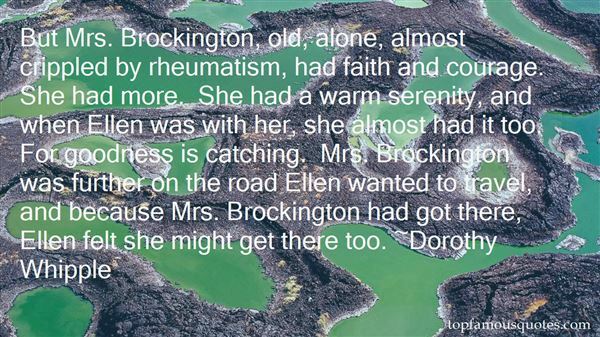 Mrs. Brockington was further on the road Ellen wanted to travel, and because Mrs. Brockington had got there, Ellen felt she might get there too." 7. "Every noble house had its words. Family mottoes, touchstones, prayers of sorts, they boasted of honor and glory, promised loyalty and truth, swore faith and courage. All but the Starks. Winter is coming, said the Stark words." 8. "If contemporary Christians took seriously the possibility that those outside the boundaries of the church might hold the promise of renewal, if we ceased regarding ourselves as the source of salvation and the secular world as a potential threat, and if we emulated Jesus' example in accepting the faith and the courage of those who live beyond conventional standards of purity, well, I can hardly imagine how things would look." 9. "And here's a story you can hardly believe, but it's true, and it's funny and it's beautiful. There was a family of twelve and they were forced off the land. They had no car. They built a trailer out of junk and loaded it with their possessions. They pulled it to the side of 66 and waited. And pretty soon a sedan picked them up. Five of them rode in the sedan and seven on the trailer, and a dog on the trailer. They got to California in two jumps. The man who pulled them fed them. And that's true. But how can such courage be, and such faith in their own species? Very few things would teach such faith.The people in flight from the terror behind - strange things happen to them, some bitterly cruel and some so beautiful that the faith is refired forever." 10. 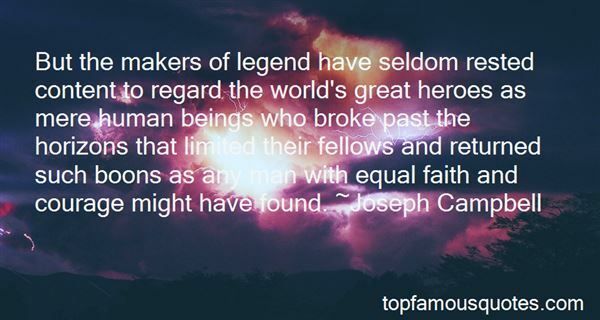 "But the makers of legend have seldom rested content to regard the world's great heroes as mere human beings who broke past the horizons that limited their fellows and returned such boons as any man with equal faith and courage might have found." 11. "I think I know now why Jesus had such a tender spot in his heart for the poor. It takes great faith and simplicity of spirit to be poor and not despair. It takes enormous courage to decide to keep on living. The homeless are remarkable people. Their very life is a prayer -- desperate, silent, unspoken pleading with God to keep them alive. And by some miracle, no, not one miracle, but by a continuous chain of miracles all day long and all night, they do stay alive, especially on freezing cold days and nights." 12. "Each of us has an inner dream that we can unfold if we will just have the courage to admit what it is. And the faith to trust our own admission. The admitting is often very difficult." 13. "A novel takes the courage of a marathon runner, and as long as you have to run, you might as well be a winning marathon runner. Serendipity and blind faith faith in yourself won't hurt a thing. All the bastards in the world will snicker and sneer because they haven't the talent to zip up their flies by themselves. To hell with them, particularly the critics. Stand in there, son, no matter how badly you are battered and hurt." 14. "It takes vision and courage to create - it takes faith and courage to prove." 15. "This is my wish for you: Comfort on difficult days, smiles when sadness intrudes, rainbows to follow the clouds, laughter to kiss your lips, sunsets to warm your heart, hugs when spirits sag, beauty for your eyes to see, friendships to brighten your being, faith so that you can believe, confidence for when you doubt, courage to know yourself, patience to accept the truth, Love to complete your life." 16. "At times we have to step into God's silence and patiently wait. We have to put out the fleece as Gideon did (Judges 6:37-40), and wait for the descent of the divine dew, or some kind of confirmation from God that we are on the right course. That is a good way to keep our own ego drive out of the way.Yet there are other times when we need to go ahead and act on our own best intuitions and presume that God is guiding us and will guide us. But even then we must finally wait for the divine backup. Sometimes that is even the greater act of faith and courage, and takes even more patience. What if the divine dew does not fall? What do we do then?When either waiting or moving forward is done out of a spirit of union and surrender, we can trust that God will make good out of it—even if we are mistaken! It is not about being correct, it is about being connected." 17. "I am Darkness. I am Shadow. I am the Ruler of the Night. I, alone, stand between mankind and those who would see mankind destroyed. I am the Guardian. The Soulless Keeper. Neither Human, nor Apollite, I exist beyond the realm of the Living, beyond the realm of the Dead. 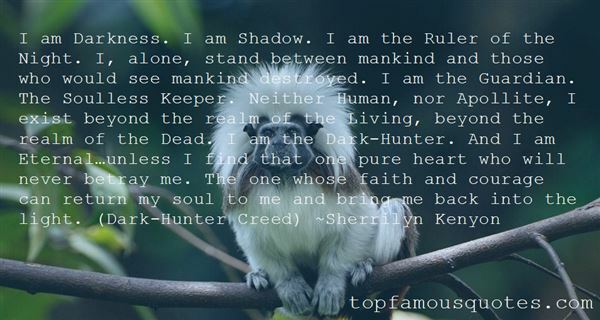 I am the Dark-Hunter. And I am Eternal…unless I find that one pure heart who will never betray me. The one whose faith and courage can return my soul to me and bring me back into the light. (Dark-Hunter Creed)"
Don't go away. I don't want to be alone. I can't stand being alone."